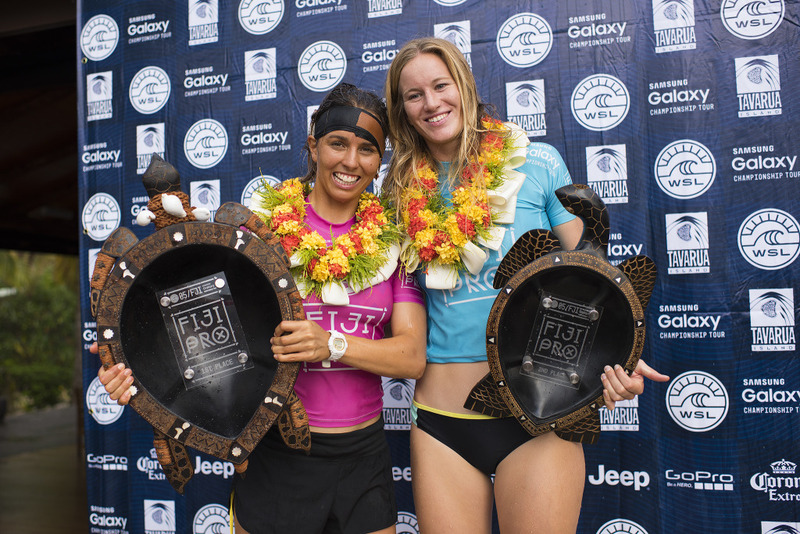 Sally Fitzgibbons (AUS) wins the fifth stop on the 2015 Samsung Galaxy WSL Championship Tour (CT), the Fiji Women’s Pro, in challenging and sizable surf. Fitzgibbons defeated Bianca Buitendag (ZAF) in the Final after a day of big upsets which saw the world’s best female surfers battle one another in solid eight-to-10-foot (3 – 3.5 metres) waves at Cloudbreak. Today’s victory is Fitzgibbons’ first of the year and the ninth elite CT win of her career. The result sees the Australian move up three places to third on the Jeep Leaderboard, putting her firmly back in the world title race. The 2014 event winner was able to defend her title, claiming back-to-back wins in Fiji despite suffering a perforated eardrum in Round 2. Fitzgibbons showed commitment, focus and resolve throughout the Final and was the first competitor to post a significant score, a 9.23, to put Buitendag in a combination situation with only 2 points on the board. With twelve minutes remaining the South African broke the combination with a 6.90, now looking for an 8.67. An exciting final exchange saw Buitendag claim a 7.50 while an excellent 9.33 from Fitzgibbons for two big, committed turns, sealed her victory and left Buitendag searching for two huge scores that she was unable to find. Fitzgibbons looked determined and fearless throughout the competition, powering through heavy conditions on her way to the Final. Even with her injury she sailed through her Quarterfinal match-up earlier today, eliminating one of the event standouts Laura Evener (AUS) with a near-perfect 9.73 in the final minutes. Fitzgibbons went on to face Lakey Peterson (USA) in the first Semifinal. After a heavy wipeout the Australian came back to secure an 8.73 and quickly followed up with an 8.10 under Peterson’s priority for a commanding lead. The American had only 3.33 on the board as the clocked ticked down and Fitzgibbons moved through to the Final. Today is Buitendag’s second Final appearance of 2015, after a match-up with Courtney Conlogue (USA) in Rio, and the third of her CT career. The South African earns 8,000 points for the runner-up result and jumps up three places on the Jeep Leaderboard to 6th. Buitendag was in devastating form today, posting three nine-point rides on her way to the Final. The South African got the better of Malia Manuel (HAW) in Round 4 and Nikki Van Dijk (AUS) in the Quarterfinals, where she began her heat by breaking her favorite board but quickly recovered, posting a 9.70 on her back-up. An 8.33 left Van Dijk in a combination situation and saw the South African through to the Semifinals where she faced good friend Johanne Defay (FRA). Defay has delivered incredible performances throughout the competition however, it was the South African that dominated the heat with two consecutive nine-point rides for an 18.40 heat total. Despite posting an 8.70 and an 8.27 Defay she wasn’t able to find the near-perfect score needed and takes home a third-place finish. Defay looked electrifying, eliminating world no. 5 Tyler Wright (AUS) in Round 4 with two excellent scores, a 9.27 and a 9.33, and the highest heat total of the entire competition, an 18.60. The 2014 rookie of the year also took down American powerhouse Courtney Conlogue (USA) in the Quarterfinals. Today marks the third CT Semifinal berth for Defay and her best result this year. Peterson, who went down to eventual winner Fitzgibbons, goes home in equal third place. Today was her first Semifinal appearance since the Rio Pro last year and her best result of 2015. Peterson previously delivered two big upsets, first by defeating event standout Tatiana Weston-Webb (HAW) in Quarterfinal 2. The rookie looked dominant through the opening four rounds of competition, posting two nine-point rides before succumbing to Peterson. The American also took down two-time World Champion and current no. 1 on the Jeep Leaderboard Carissa Moore (HAW) in Round 4. The 9th place finish is Moore’s worst result since the Swatch Women’s Pro last year, where she was also defeated by Peterson in Round 4.